Everybody knows about the Bloody Mary, but many folks aren't aware that Canada has its own special version made with clam juice added to the tomato juice. 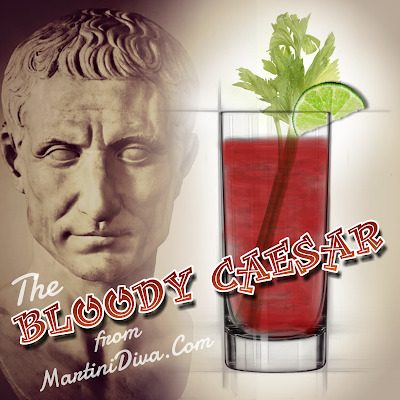 Rumor has it the Bloody Caesar was invented by bartender Walter Chell who created the drink for the 1969 opening of Marcos restaurant. It became such an instant hit in Canada that Mott's even came up with a juice inspired by the Bloody Caesar - Clamato. Originally called simply a Caesar by Chell as a tribute to his Italian heritage, it took a patron at Marco's who exclaimed, "Walter, that's a damn good bloody Caesar" to mix in the Bloody. DIRECTIONS Combine ingredients in an ice filled cocktail shaker and shake until chilled then strain into an ice filled glass, garnish and serve. P.S. if you really want to have some fun with this cocktail, especially on the Ides of March, smear some ketchup on the blade of a steak knife and lay that across the rim of the drink. GREAT DAYS TO DRINK THIS COCKTAIL: National Caesar Day, May 18th. The Ides of March, March 15th.